If this is the year you’ve decided to make up for decades of serving your mom undercooked eggs and burnt toast in bed on Mother’s Day, we’ve got you covered with these fabulous and fresh celebration ideas. Read on for some elegant and lovely ways to celebrate the mom in your life. Go Brunch! Brunch is one of the easiest and most versatile meals to plan –almost anything goes! You don’t need a specific food theme or menu. And it’s an easy meal to collaborate on, especially if you’re using SignUp.com to organize the details! 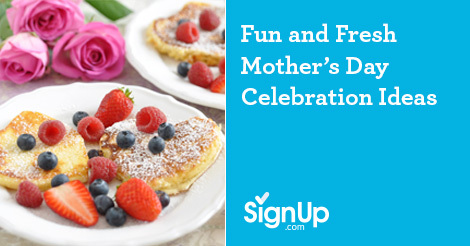 Click here to get started planning a celebration brunch or potluck. Go Outside! After months stuck inside due to the dreary winter weather, Mother’s Day is often the perfect time to kick off the spring entertaining season. Set up a buffet table and sprinkle lawn chairs around your yard (borrow or buy.) Pinwheels and tiki torches add festive touches and clean up is a breeze! Go Vintage! Décor! Haunt neighborhood garage sales and thrift shops to purchase mismatched china and silverware, and then drape tables with faux pearls and pastel candles in hurricane glass. Add a couple of pastel bouquets for a true time warp feeling. Go High Tea! A lot of us never really outgrow our desire for tea parties. Serve a menu complete with tiny, crustless tea sandwiches and tea with sugar cubes and cream. Dessert could be petit fours. For added elegance, ask guests to wear hats and gloves. Go Hiking! If your mom is the active sort, take her on a hike along with the whole family, and tote along a picnic lunch. Even if she’s not much of a hiker, a picnic at the local park could be a no-fuss way to gather family outdoors. Bring a tablecloth that can double as a blanket, sandwiches and wraps for food, along with fresh-cut fruit and pound cake for dessert. Don’t forget the cooler of lemonade and the frisbee for the kids! Go Write! Whatever you decide to do to celebrate mom this holiday, make sure you include messages that tell her what she means to you. You could take a small decorative notebook or scrapbook and pass it around the family, having each family member write a short anecdote or sentimental message. Present this with a hand-tied bouquet.